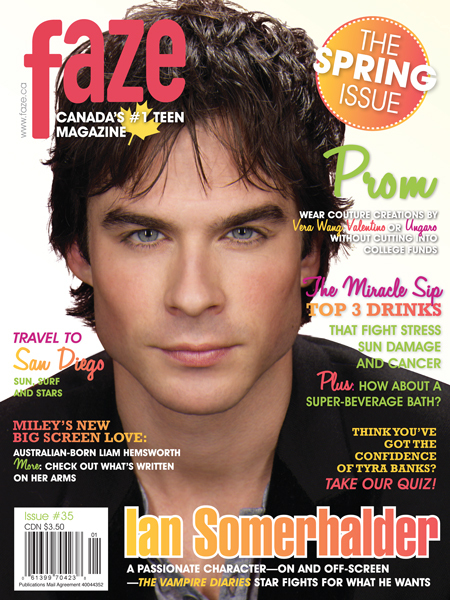 PLUS: We ask Ian, have you ever played the bad boy in real life? How do you use fashion as a way to express yourself? FOR FUN: Whaddya think is the worst fashion trend of all time? The Drive To Be Thin: In an age where there are more messages of female empowerment than in any other generation, why are more girls struggling with body image and self-esteem than ever before? Degrassi: TNG’s Jessica Tyler, Melinda Shankar and Annie Clark show off amazing designer dresses that—no joke— could be within your reach! QUIZ: Take Our Celebrity Confidence Quiz!